My family loves cookies. Hell…I love cookies but I don’t make them much any more. One reason is because my backside seems to be trying to take over it’s on time zone and the other is because of time. Evan doesn’t get to bed until 8:30 or 9 and after that I need some much needed “me” time! Last night the puppy dog eyes & whining finally won me over so I went online to find a quick, easy and yummy recipe for cookies. I turned to one of my favorite food blogs, Dinner with Julie, and as always…she did not disappoint! Mix butter and brown sugar together in a medium mixing bowl. Add egg and vanilla. Mix until smooth and lump free. Mix together flours, baking powder and salt in a small bowl. Add to butter mixture and stir until just combined. Fold in chocolate and butterscotch chips. Spray an 8X8 pan with cooking spray. Spread batter in the pan and bake for 20 – 25 minutes or until golden brown. Don’t overbake if you want them to be chewy. Recipe Notes: Two thumbs up from my family and the lady that sits beside me at work. 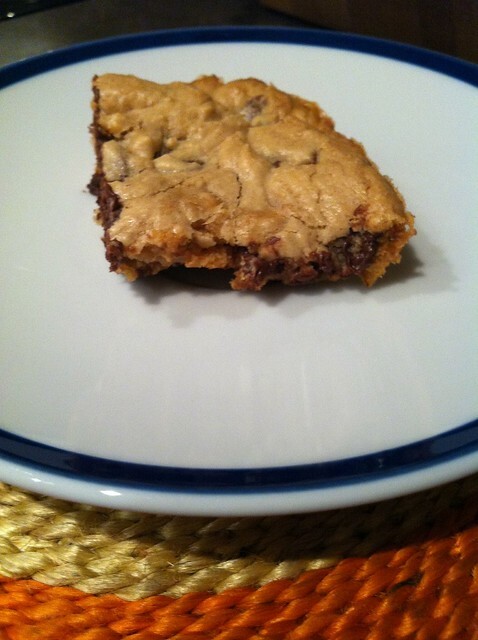 This recipe is perfect for a busy night & it doesn’t make a ton of cookies to try not to eat. oh yes — these will be tried.